Appearance: Xy has long mop of black hair and dull blue eyes. She is very pale, to the point where it looks like she's sick. She is very small for her age, some may mistake her as a twelve year old. She dresses like a commoner, but she won't let anyone see her if her clothes look old and/or dirty. She has a pillar-shaped mark on her chest, the symbol of the god of strength, Samekh. 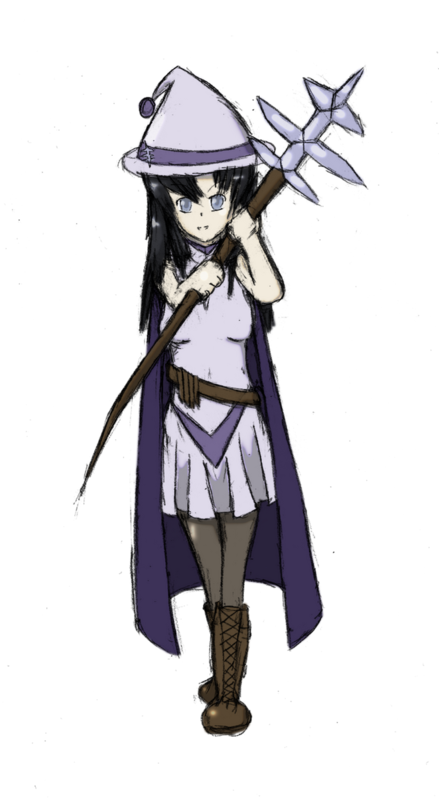 History: Formerly an Apprentice Mage from Iaymar, she performed a memory spell on herself to force her to forget how to use magic so she could leave the country. She kept a journal of her studies from Iamayr and is slowly relearning the basics. However, due to the lack of resources, she isn't very successful. As an Azara, she is (supposedly) the descendant of Samekh, the Eshdoan god of power and strength. Personality: A little bossy and spoiled, but extremely vain. Having to spend the last year trying to relearn magic and failing, she had become much easily angered and frustrated. She's the type of person who always wants to be in control, and will try to take down anyone who gets in her way. Weapons: A wooden staff and a copper dagger. Abilities/Skills: Energy magic (electricity, freezing, and fire) and simple control over the elements. As Mage of the Pillar, she can perform a spell that summons a powerful and destructive beam of light from the sky. However, it always lands right on her and has a chance of killing her or severely burning her. She can summon a familiar, which takes the form of a small black cat named Lyra. Lyra can lengthen her tail to capture and hold enemies and do the same with her claws. Appearance: Raiden is a tall man and well-toned. One look at his face and you'll notice that he has bright green eyes, or just one, as his right eye is covered by an eyepatch. His dark brown hair is combed back on the left side while his bangs hide the right side of his face. He wears a blue military jacket with gold buttons (like this), khaki pants, and brown boots. He also wears a tool belt. History: After his father's (and his sister's, Reyna) death by Aingott when he was fifteen, he was left in charge of the family's business in building and fixing machine parts. In the same event that killed his father, he lost his right eye and received many burns from being pushed into an open fire. Eventually, he decided that doing the family business wasn't for him, that it was too boring. Personality: He's very quiet, doesn't talk much. He'll do what other people tell him to do, usually without hesitation. He just lets himself get pushed around. However, he's quite manipulative. Since he knows exactly when and how he's gonna die, he'll do whatever to save himself. He's also a bit of a pervert. Weapons: A wrench and a hammer, plus everything else in his tool box. Abilities/Skills: Engineering. He knows how to build and fix stuff that works. He can also fence, but not very well. He can also use mounted guns, but not normal muskets because he doesn't have a steady aim. Also, due to Aingott poison, he has fast reflexes and another perk that'll show up later. Appearance: As he is part Faceless, his appearance tends to vary. Currently, he has blond wavy hair and dark skin. He has very light gray eyes. His clothing also varies, but he usually wears some sort of face mask when in public. History: As a result of a union between an Eshdoan noble and a Faceless slave, Marcus had been an outcast since birth. However, when his father, one of the twenty-two Sages, died when he was a child, he was forced to follow in his footsteps, as he was his only heir and therefore the only one who could take the title of Zayinas, Sage of the Sword. While training in Iamayr he learned very powerful Eshdoan magic. He met Xyriel, and decided to help her escape the country in order to spread around Eshdoan magic. He left with her and escorted her to Planaya, and then went on his own way afterward. Personality: A very cheerful and odd fellow to most people, although he is very paranoid about having people touch him and watch him cast magic. He is also a bit of a trouble maker, casting spells on airships and dragons so that they’ll be too heavy to fly. He loves working with kids and sometimes teaches them magic, if he feels that they are pure enough. He is an excellent teacher, although many of his “students” may not be aware that they are being taught. Weapons: A longsword that can also cast magic. Abilities/Skills: As a Faceless, he can mimic other’s appearance by coming into direct contact with them, but his shapeshifting powers are limited. He can only mimic humans and can mimic only a single trait from each person, and the trait he receives is completely random, giving him a very odd appearance. He also knows very powerful battle magic and is a very good sword fighter. He can summon a familiar, which takes the form of a green slimeball thing with a mouth. Its name is Pon. Pon has a black hole for a stomach and can vomit acid onto enemies. Pon also has a very powerful sense of smell.